When it comes to retro-gaming, it doesn't get much more retro than Asteroids. Released in the arcades back in 1979, a year after Space Invaders and only six years on from Computer Space (the grandaddy of them all), Atari's vector-based blast 'em up has really stood the test of time incredibly well. Over the past 32(!) years there have been countless updates, remakes and clones, but very few have modified the game's traditional formula of rock-blasting, instead usually opting for graphical and audio improvements and/or the addition of new enemy types, bonuses and so on. 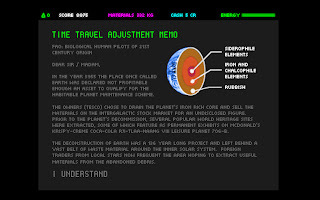 It's an incredibly over-populated genre, so when I first read about Super Space Rubbish on indiegames.com I initially discarded it as being yet another clone (albeit one with glowy neon graphics). Please, I implore you, do not make the same mistake. 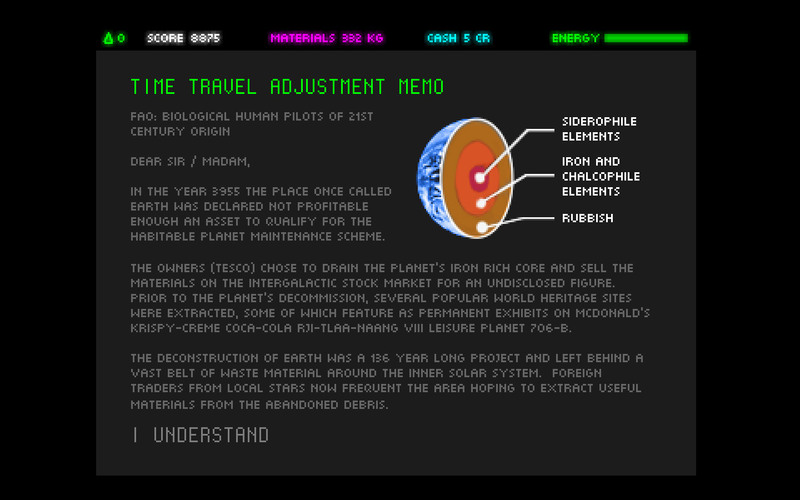 Slakinov Games' have taken the Asteroids concept to an entirely new level. 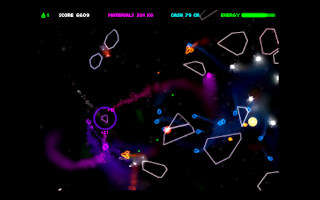 Playing more like an arcade sci-fi roguelike than a standard rotational shmup, the game features noticeably more realistic physics than the original with asteroids actually splitting where your bullets hit them and recoiling appropriately when colliding with your shots or other debris/space craft. In addition to this, asteroid-cracking produces floating resources that you can collect, refine and sell on to passing drone stations in order to upgrade your ship's weapons, shields, engines and refining ability. The game itself is based in the debris field left after the 'decommissioning' of Earth, with you and other prospectors battling over the resources and fending off alien space critters. Starting with 300 credits, it's up to you to mine, fight and upgrade your ship as you choose over a series of increasingly tough levels - and despite the maddening difficulty it has me completely hooked. As you'd almost expect from a modern indie title, there are a variety achievements to be unlocked in Super Space Rubbish, with awards given for reaching standard mileposts (earning X number of points, blasting X number of rocks, etc.) and also for different playing styles. There's a huge amount of depth here for such a simple concept, and although I've only played it for a couple of hours, it seems that each time I start a new game I notice something else, be it an amusing message at the bottom of the screen, unlocking a new achievement or finding a more efficient way to earn points/credits. 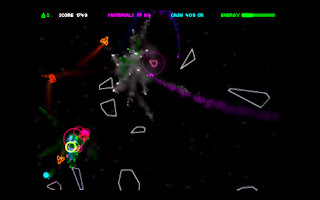 There have been some interesting design choices made that separate Super Space Rubbish from other Asteroids clones, the most notable of which involves the screen-wrapping; although the asteroids and enemy ships can leave the screen to reappear on the other side, you are limited to movement within artificial barriers around the border. This can make the game very difficult at times, as you can easily get hemmed-in by enemies and floating space junk in the corners of the screen whilst being attacked from all directions. On the plus side, the addition of auto-saving checkpoints make the game a little more forgiving, but you'll still find yourself dying over and over again - Super Space Rubbish is not by any means an easy game. Possibly because of it's slow-paced start, or brutal difficulty and complexity when compared to your average casual flash game, Slakinov failed to find a sponsor. However, instead of leaving the game sitting to slowly develop bit-rot on their hard drives, they have put the game up for sale via bandcamp along with Datasette's excellent soundtrack for the meagre sum of $4. Even better still, they have a deal in which for $1 extra you will receive a copy of PixelJam's acclaimed Dino Run as well! It's a brave move (which is unlikely to return the same level of funds as a sponsorship deal), so Slakinov should be commended for sharing this special little game. 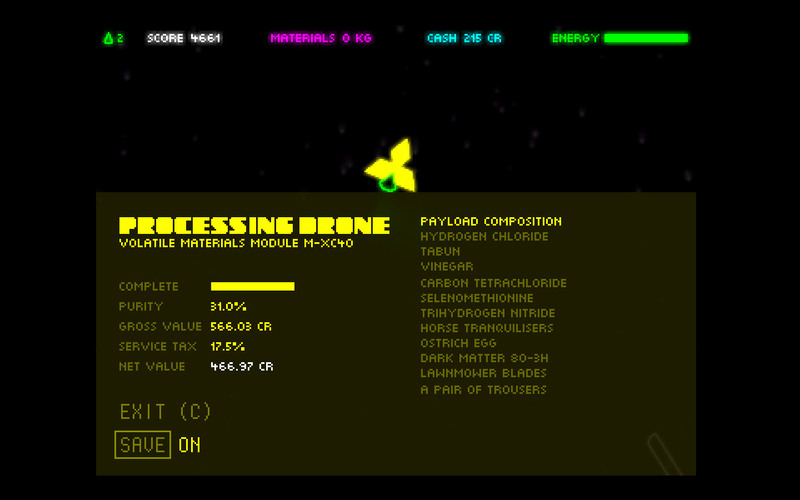 As far as I'm concerned, Super Space Rubbish is a must have release, and at this low price it is an absolute steal. 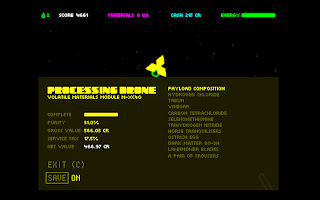 Download the demo and buy the game here (from the Slakinov website).